It was an emotional tribute of our time, President Donald Trump and first lady Melania Trump paid tribute to the Rev. Billy Graham on Wednesday at the U.S. Capitol, where the evangelist leader’s body lay in honor. The ceremony was marked with great congressional leaders and government officials; Trump talked of Graham’s achievements and his rise to prominence as a religious leader. The president also reminisced about Graham’s impact on him growing up and told a story of his father encouraging the family to attend an event at Yankee Stadium where the evangelist was speaking. The Rotunda was filled with several cabinet members and political leaders, including Attorney General Jeff Sessions Senate Minority and Leader Chuck Schumer (D-N.Y.). The man we recognize today shared the Gospel with more people face to face than anyone else in history,” McConnell said. Graham, who met with 12 U.S. presidents during his career and counseled several of them, died in North Carolina last Tuesday at age 99. He is the first religious leader and fourth private citizen to receive official recognition at the Capitol, the last being civil rights leader Rosa Parks in 2005. 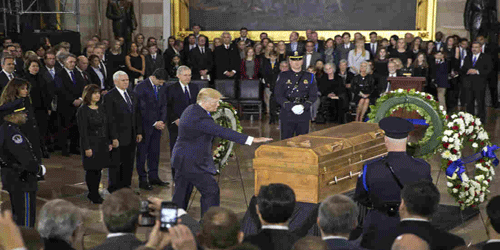 Some observers questioned the appropriateness of the government’s officially honoring an evangelical Christian, but Trump said that it fitted for Graham to receive the tribute. The body of Rev. Billy Graham, who died last week at age 99, lies in the Capitol Rotunda. The ceremony lasted about an hour. Graham’s body will stay at the Capitol on Wednesday, with public visiting hours from 1 p.m. to 8 p.m.
Trump and Pence will attend his funeral on Friday in Charlotte, North Carolina. 0 responses on "President Trump Tribute To Billy Graham"